Cradle yourself in comfy contoured curves while also showing off your sleek stylish side with the Bowen Adjustable Bar Stool by Sunpan. Created with a refined recipe of retro aesthetic along with a dash of Danish influence, Sunpan�s Bowen Adjustable Bar Stool is crafted in your choice of eye-catching yet easy-to-incorporate two-tone palettes featuring the lush look of quality wood veneer against faux leather. Securely set atop a stable base of shining polished steel complete with a footrest, Sunpan�s Bowen Adjustable Bar Stool offers elegance with an edge when mixed or matched in many modern motifs. Easy to adjust for added flexibility. Faux leather seat and back deliver superior comfort. Stainless steel frame offers outstanding support. 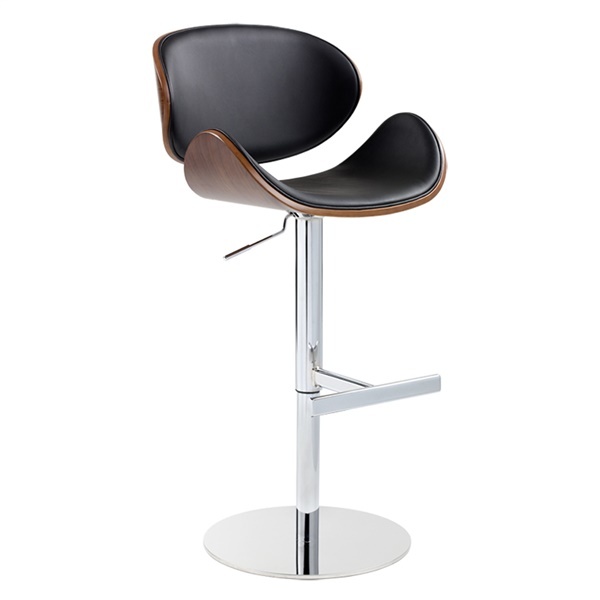 Urban-inspired design makes the bar stool a wonderful choice in a contemporary setting. What is the weight capacity? What are your store hours and do yo have this in store? The Bowen Adjustable Bar Stool is rated for use up to 250lbs. Unfortunately, we do not have any retail locations, as we are solely web-based.